I not only love to share great organic companies and organic products with you, but even better is when these great organic companies give back and strive to make a difference for the less fortunate in our world and make a difference in people's lives! I am happy to share with you that one of our family's favorite organic bread companies, Rudi's Organic Bakery is one of those awesome companies giving back! Rudi’s Organic Bakery is paying homage to its entrepreneurial roots through a microloan program with Kiva, a nonprofit organization with a mission to connect people across the globe through lending to alleviate poverty. Rudi’s Organic has set a goal to loan $25,000 to 25 entrepreneurs in 25 days. The amazing stories behind these entrepreneurs inspired us to create a Facebook application entitled, “Seed. Sprout. Grow.” Through this application, fans can select an entrepreneurial story that inspires them and ‘share’ it on Facebook, Twitter or Pinterest. It’s pretty simple - for every story shared, Rudi’s will loan $5 until they’ve reached the $25,000 goal. They would LOVE your help in reaching this goal! Simply visit the ‘Seed. Sprout. Grow.’ application and select an entrepreneur whose story touches you and share with your readers. For each share that your post receives, Rudi’s will also loan $5! You can track the shares and loans on the heart-shaped ‘giving meter’ which is updated weekly within the app. 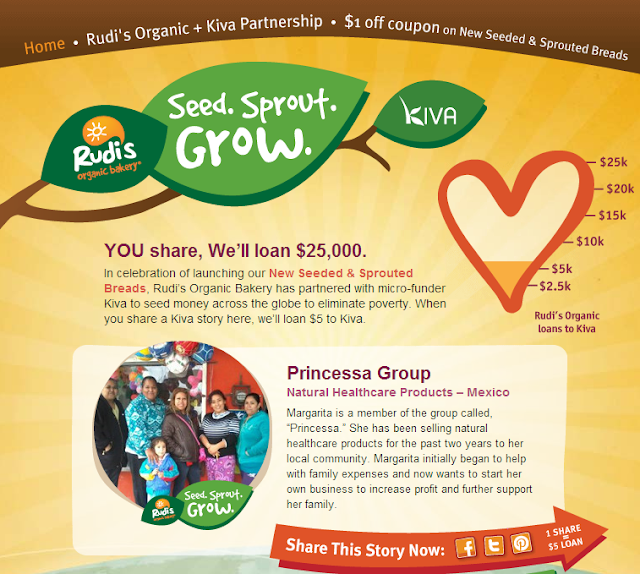 Fans who want to loan more can join Team Rudi’s Organic on the Kiva website and loan additional funds in the dollar amount of their choice. This program was in part inspired by the introduction of Rudi’s Organic’s new Super Seeded and Sprouted Breads, which offer super nutrition without sacrificing the flavor and soft texture of Rudi’s Organic breads the whole family has come to enjoy. Keep an eye out for the $1 off coupon for any Rudi’s Organic product inside the Facebook app! So make a difference in an entrepeneur's life and start sharing their stories today!